Over time, I consistently participated in Semicolon's Saturday Reviews and every so often I'd click on Jama Rattigan's blog and read her review of some children's book she'd read and was talking about. I'm ashamed to admit it but it took me a really long time to figure out that she was an author. A published author. Of a children's book. *Gulp* Sometimes I'm a little slow . . . (forgive me)! After nap time we cuddled up and read her books. Dumpling Soup , for those of you who are unfamiliar with it, is about a family celebrating The Chinese New Year together. This particular family lives in Hawaii and is made up of Koreans, Japanese, Chinese, Hawaiians and haole (i.e., white folk). 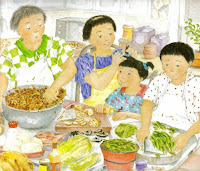 As they prepare to celebrate this holiday, the young girl in the story, Marisa, learns to make dumplings with her mother, grandmother and aunts. It is a story of family togetherness and tradition and it is very well-told. I really loved it. After I read the story I went back through and just looked at the pictures without reading the words. The illustrations by Lillian Hsu-Flanders compliment the story very well and practically tell the story all by themselves. It is a nice combination of an author/illustrator and a heart-warming story to boot! 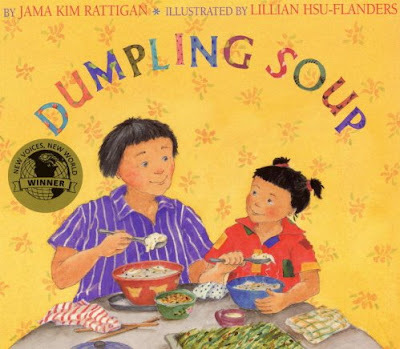 Upon completing Dumpling Soup, I promptly picked up Truman's Aunt Farm . I thought this story was clever and funny. It tells the tale of young Truman who receives a package from his Aunt Fran. Inside the package are two envelopes - one addressed to Truman and the other addressed to an Ant Farm. Truman is instructed to send off the letter in order to claim an Ant farm. He mails off the letter post haste and receives an instant response -- lots of aunts. Truman eventually has so many aunts that he doesn't know what to do with them so he advertises them off to other little boys and girls who might be in need of such friendly relations. Very, very cute idea and, again, well told. I liked it very much. Turns out that apparently Rattigan's mother was one of twelve children and so Jama had plenty of aunts growing up that she loved spending time with. Overall I have the strong sense that Jama Rattigan is big on family and togetherness. Her personal blog suggests nothing less, nor do her stories. If you haven't checked out her books, I'd urge you to do so - and not just because she reads this blog from time to time! No, I'd urge you to check them out because they are genuinely GOOD! If I didn't think so, I wouldn't have created this post. Dear JKR - Thank you for your superb work which I will now share with my kiddoes as they grow up! I'm so glad to know of this and I appreciate all that you do and say to encourage other people in their personal journeys! Thanks for the intro - I've gone and requested both of these books at the library! Well, Carrie, you've just made my day! Thank you so much for this post, and for reading my books!! OH, wow! I'm just speechless about this, Carrie! How neat that I am posting just below the esteemed author herself! Thank you so very much for sharing this--I'll definitely look for these at our library! I'm so glad you're still participating in Read ALoud Thursday! I love doing it, even if I don't always get a lot of participation. Isn't it amazing what this little thing called blogging brings us?